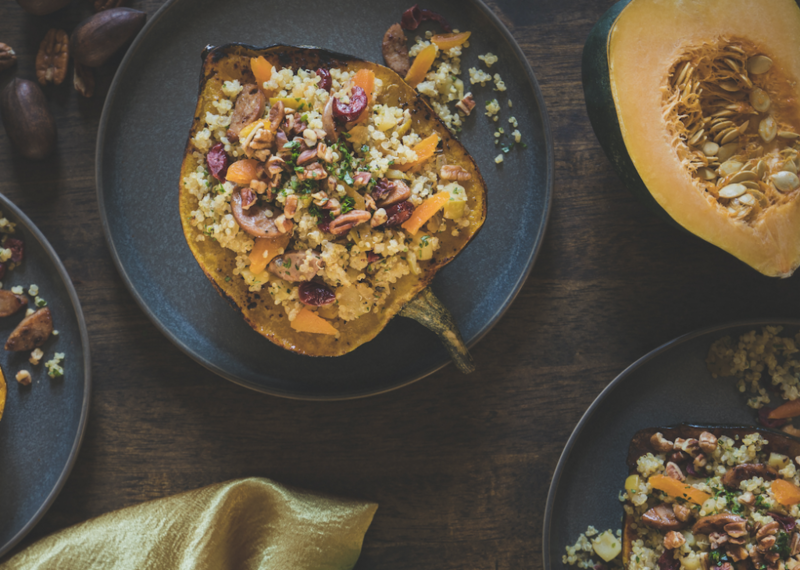 Stuffed acorn squash filled with quinoa, apples, chicken and apple sausage, sage, and warming fall spices and flavors is a comforting and colorful dish loaded with healthy and delicious flavors. One of the things I love most about fall is the variety of seasonal fruits and vegetables like winter squash that allow you to savor the season. 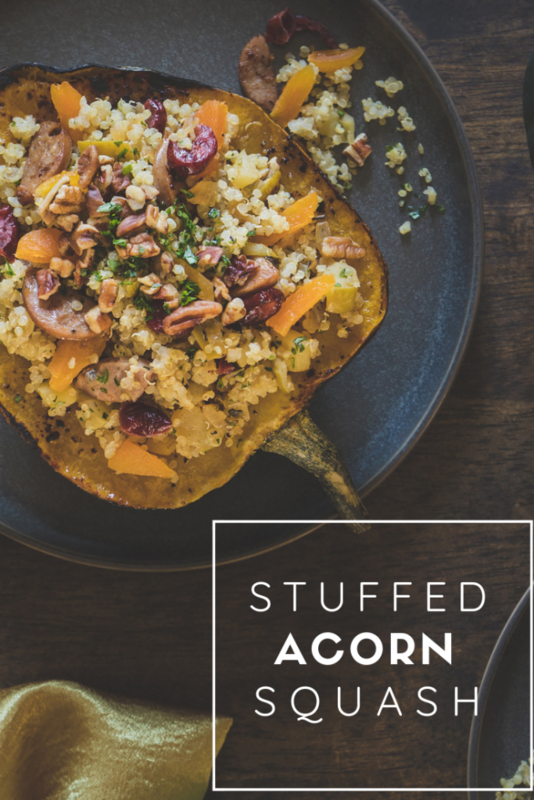 This gluten free stuffed acorn squash recipe has an amazing fall flavor profile with earthy sage, savory squash and it’s full of healthy carbs like quinoa and dried fruit and nuts to help keep you full longer. Start by roasting the prepared squash on a baking sheet for 30 minutes until it’s soft and tender. While the squash is roasting, you can prepare the stuffing. Saute an onion and zucchini and add to it the chicken and apple sausage until browned for an amazing flavor combination. Open Nature, sold exclusively at Safeway and Albertsons stores, has several natural sausage combinations and the chicken and apple sausage flavor is one on my children’s favorite. I serve it alongside cinnamon apples and wild rice, but in this recipe, it’s sliced into small pieces and browned to give great texture and protein to the stuffed acorn squash. Once the sausage and veggies are cooked through, remove from the pan and add the chicken broth and quinoa to cook through. Once the quinoa is cooked, fluff it with a fork and mix in the sausage and vegetable mixture as well as any dried fruit and pecans. Remove the squash from the oven and stuff with the prepared quinoa, vegetable and sausage mixture and bake again for 15 minutes until it’s heated through and the nuts are toasted. This is a perfect Sunday night dinner option and an even better option to serve at a dinner party. Not only is the presentation gorgeous – the flavors are amazing and you’ll have everyone asking for the recipe. 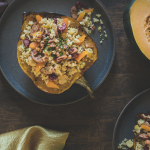 Take advantage of the sales on acorn squash – just $.99/lb., dried cranberries, pecans, broth, and fresh herbs to add this meal to your meal plan this week. You can easily make this dish vegan or vegetarian by eliminating the sausage or replacing it with chopped mushrooms and substituting vegetarian broth for the chicken broth. Preheat oven to 450ºF. Brush each squash with olive oil and sprinkle with kosher salt and freshly ground black pepper. Place squashes cut-side down on a baking sheet covered in parchment paper. Bake for 30 minutes, until squash is tender and edges are golden brown. In a pot sprayed with cooking spray and heated to medium-high, sauté chopped onion for 7 minutes. Add sausage and zucchini, sautéing until well-browned. Add garlic, sage, and rosemary, sautéing one more minute. Move sausage and vegetable mixture to a plate and cover with foil. Set aside. Add broth and quinoa to the empty pot and bring to a boil. Cover, reduce heat and cook 15 minutes, until quinoa is done. Fluff with a fork, and fold in sausage and vegetable mixture. Fold in parsley, dried fruit and pecans. Fill the squash halves with the quinoa mixture, dividing it equally. Put stuffed squashes back into the oven at 400ºF for 15 minutes. Remove and serve immediately! Instead of zucchini, consider swapping (or adding) sliced mushrooms, chopped apple or chopped pepper. Sauté all veggies along with sausage. Add a pinch of red pepper flakes for a kick of heat! Roasted walnuts or hazelnuts may be substituted for the roasted pecans.